Southeastern Insulation uses spray foam insulation, made of polyurethane froth, which is the same kind of appliance that manufacturers have used in refrigerators and water heaters. It can be used as an insulating and air sealing product for residential wall and ceiling cavities. The Buford spray foam insulation is sprayed onto the wall cavities thereby expanding it. 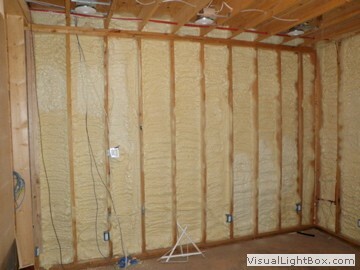 The Buford spray foam insulation product also helps control moisture condensation because it does not shrink or settle. It is fire resistant and reduces heating and cooling costs significantly and its thermal seal keeps cold air in and unwanted air out. Spray on insulation has also been known to improve indoor air quality, thereby decreasing the likelihood of allergies. It also has high quality sound control, and significantly reduces dust, mold and mildew accumulation. Most importantly, the froth from the spray has been known to help the economy and the environment by using recycled materials in the froth. The containers are usually also recycled. Those who use this product are committed to providing quality renewable resource based building materials. While you might be tempted to go the do-it-yourself route when removing old insulation, you should not! Due to the hazardous nature of many materials used in insulation, you could be facing serious health risks if the work is not conducted properly; this also means disposing of your existing insulation in the proper manner. Instead of taking the risk, have your insulation removed by the professional team at Southeastern Insulation today. If you’re looking for a professional Buford Spray Foam Contractor, then give us a call today at 678-561-FOAM or complete our request estimate form.